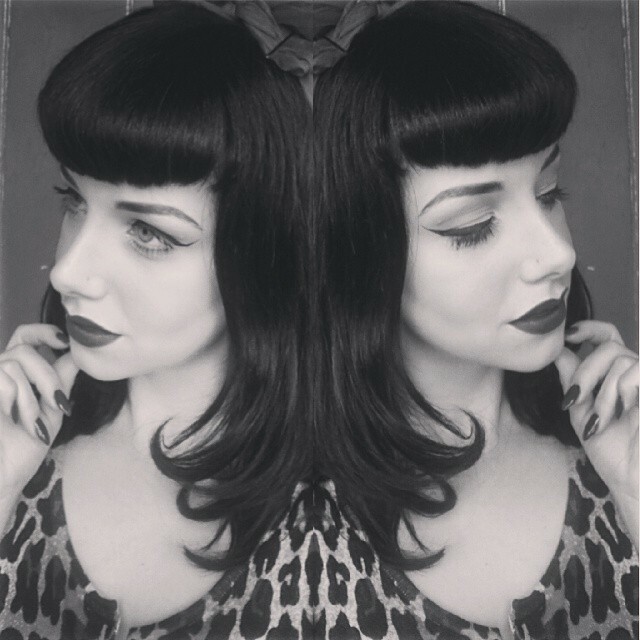 Last week I debuted my new clip-in Bettie Page Bangs. Since then, I have been inundated with questions about where others could get them! I bought mine from and local hairdressing supplies shop called Hairquip but for those who don’t live in Auckland here’s some info for you and what you should look for when buying your own. Firstly I just want to point out that I didn’t buy them cut in the Bettie Page style. As far as I can tell, there aren’t any really available (or at least good quality ones) so you have to buy a regular clip in fringe and cut it to shape. Always buy natural/real hair… never synthetic! 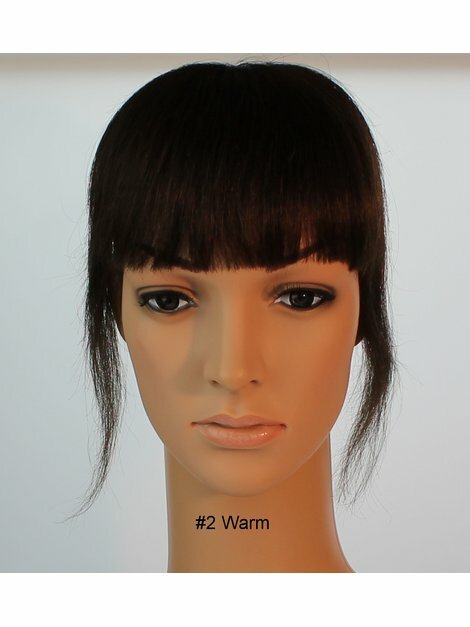 Synthetic hair can work sometimes, my clip-in ponytail is synthetic and works fine but for a fringe, you want the ability to custom dye it to match and also you want it to look natural as possible. The next thing to look for is the shape- I think it’s better to have the long pieces at the side to help blend it. I just cut the shorter section and kept the longer bits at the side. If I cut all the way around, the fringe would be too wide and look un-natural. 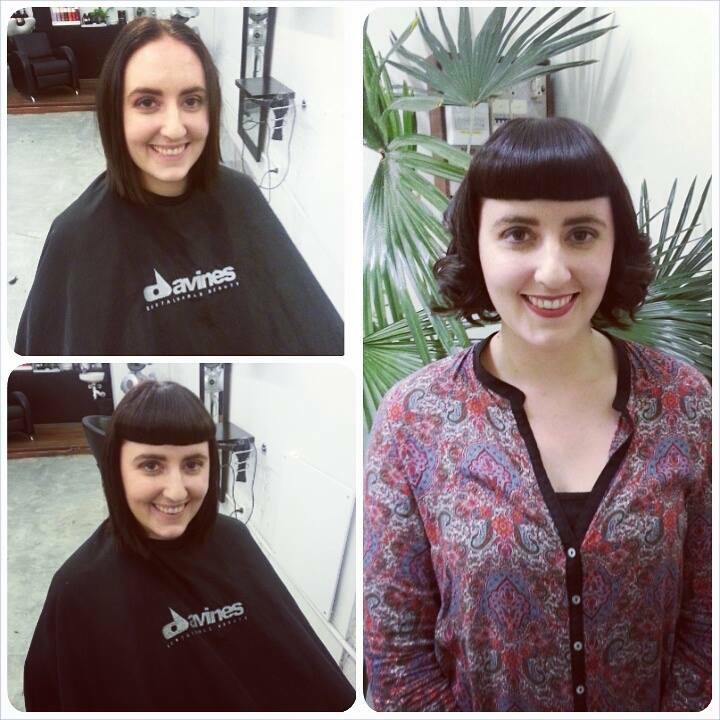 Don’t get a clip-fringe with just one length hair, you might end up with a fringe looking less like Bettie Page and more like a cross between a bowl cut and Spock. 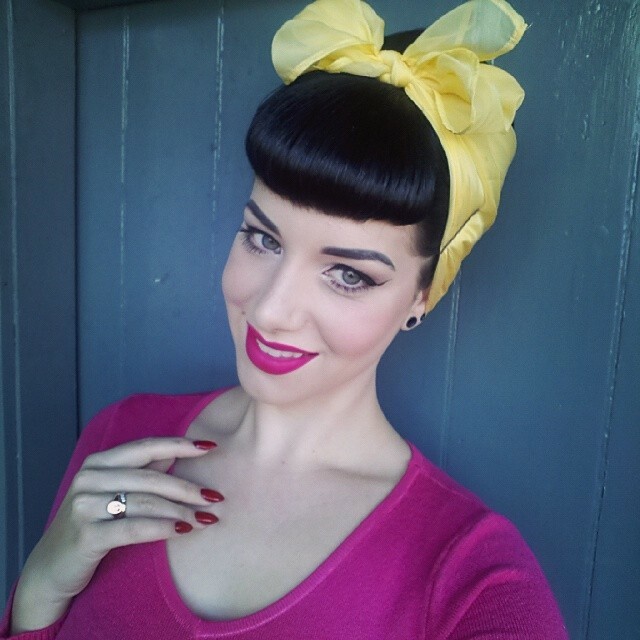 When I do my hair in Victory Rolls or a beehive, I just pin the long bits back- easy! Now for colour- you’ll most likely need to custom dye it (preferably get your hairdresser to do this to match your shade correctly). When buying one for your hairdresser to colour, go for one that matches your colour as close as possible but if in doubt, go lighter. It’s easier to just darken it down then buying one too dark and try to lighten it up. So now you’ve got your bangs, it’s very important about how you place them in your hair and therefore how short you cut them. Mine have a circle on the back and I clip them far enough back so that the edge of the circle doesn’t come past my hairline if that makes sense. Basically if you let it come too far forward and the circle hangs over your hairline, it will stick out and not sit properly. Not all clip-in bangs have the full circle so this may not be a issue for you. Weather you are cutting it yourself or getting your hairdresser to do it, always cut it when on! This ensures you have the length right and placement correct, and unless you have super sharp scissors, just get your hairdresser do it for you! Straighten the hair out, clip the long bits away and cut it on the longer side (start just about the eyebrows and curve up). 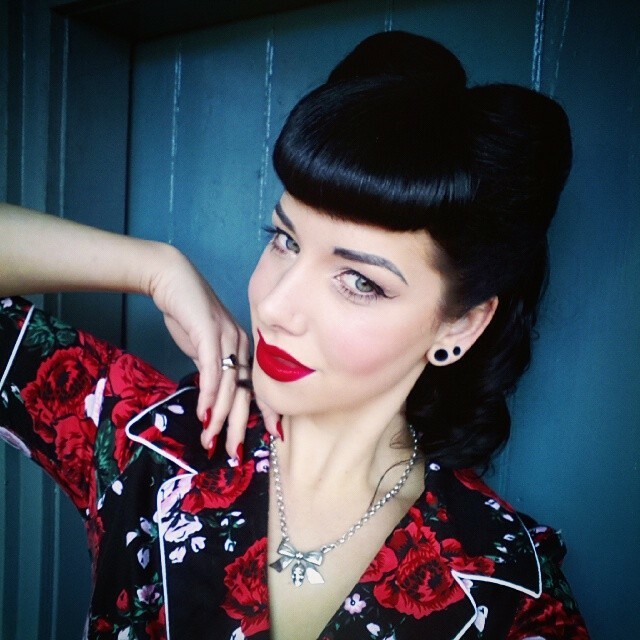 It will look terrible straight and long but then use your straighteners or curling iron to curl it under and create the iconic Bettie Bang shape. This will decrease the length quite a bit so remember to always cut it longer than you’d like it to look in the end. Also you can always clip the fringe in further back to decrease the length more. Above is my friend Sylvanna who came to see me at the salon last week. I coloured her fringe to match and cut it for her. After I cut it but before I curled it under, it was only a tiny bit above her brows so it really bounces up once curled. I tried to find a similar looking fringe to mine on eBay for all you who have been asking but are not from Auckland. This one here looks like the best I could find but it’s always tricky without seeing it in person! If you’ve had success with any particular fringes then please let me know so I can pass the info on! 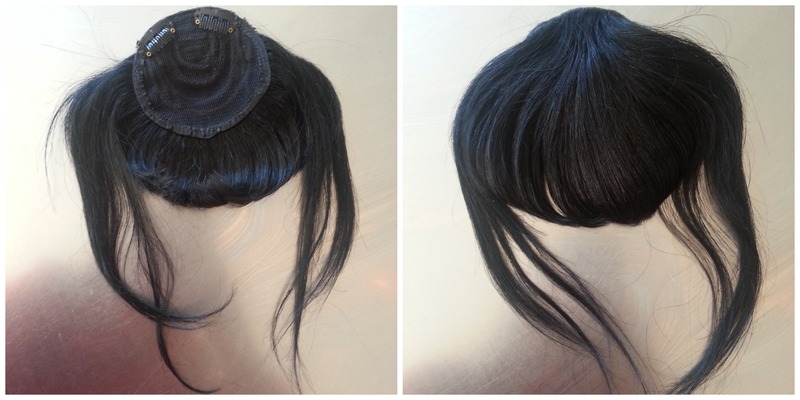 And for a bit of fun, watch this video of how bizarre it is to wear a clip in fringe! Thank you for posting this! I have curly hair and in summer the sweat on my forehead always ruins my bettie bang try hard fringe! Going to try getting one! I am in wellington so hopefully can find one like yours.